Titus and DJ at the start of the race on May 22, 2010. In June 2010, it was a dream come true for me, when Titus and I ran 16 miles down the Menomonee River to raise money for my favority charity, The Milwaukee Outreach Center. They could always use more funds, volunteers, and awareness of their cause: to help the underskilled and unemployed in Milwaukee. 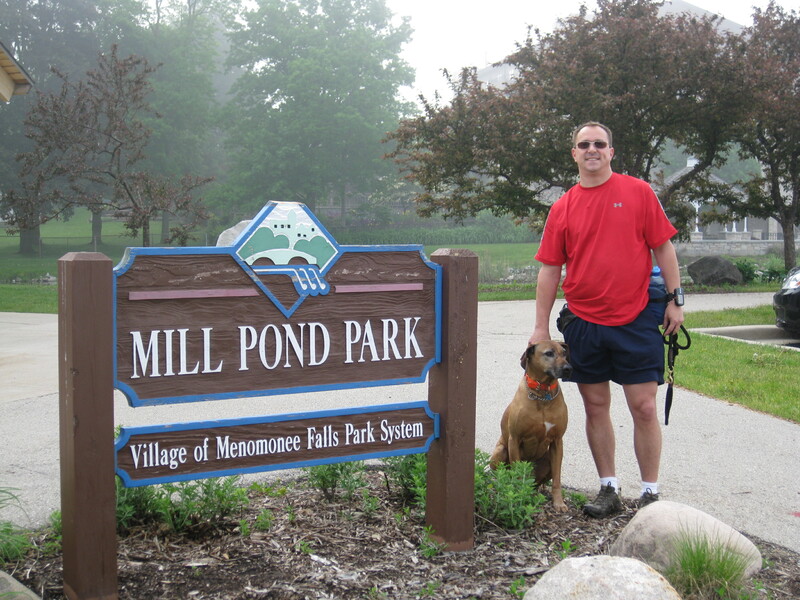 The original idea was to take everything I love (my dog, trail running, the Menomonee River, my faith in Jesus, and my favorite charity) -- and roll it into one big day! Through a home-made video and a website, the word got out and we raised about $5,000. We even had a Milwaukee Journal-Sentinel Article (click to read) written about the unusual event. My "team", which consisted of my family and friends of TMOC, handed out promotional flyers, sent e-mails, and tried to raise interest. It worked! The event was called, "Titus & DJ's Menomonee River Charity Trail Run for Jobs & Jesus". We printed some T-shirts, had a great time, and there were about 15 people at the finish line on a pleasant May afternoon. You can click here to see a great slideshow of what happened that day in 2010. After Titus died in April 2011 amidst a flurry of media attention, I wasn't sure what to do. Since I didn't have a dog of my own, I decided to expand the event into a relay that included 10 participants (with dogs) and more charities. So, in 2010, we had one charity and 15 people at the finish line. Then in 2011, we had 8 charities and 100 people at the finish line! Each year features a similar turnout. I am grateful to be a part of this. When I lost Titus, I received kindness and generosity from hundreds (maybe thousands) of people who cared about a guy and his lost dog. With that same feeling of community and cooperation, I want to give back to this great city that gave so much to me. I hope to see you at this year's picnic! 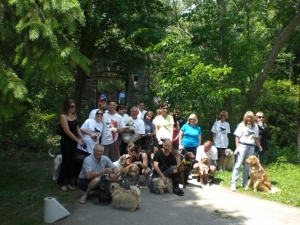 A photo of the 2011 participants at the Finish Line in Hoyt Park.